Roberts R100 review | What Hi-Fi? How many people do you think listen to the radio each year? No, it’s more than that. According to trade body RAJAR, a mind-boggling 48 million adults in the UK listen to the radio each week – that’s 89 per cent of people aged 15 and over. With so many people listening so often, you’d hope that they're doing so on a decent radio. At just under £300 the Roberts R100 has a pretty pricy tag, but is that high cost matched by its performance? At first glance, the Roberts R100 doesn’t look like your average radio. There are no dials for tuning or adjusting the volume for starters - it has been designed to look more like a wireless speaker that’s been augmented with a screen and aerial. There are navigation buttons on the right hand side of the colour screen and volume and power buttons on the left (or you can use the compatible Undok app for iOS and Android). These buttons are used to switch through the R100’s various sources – Internet radio, FM radio and DAB, as well as Spotify Connect and Bluetooth for wireless use with smartphones and tablets. There’s also an ethernet connection for a more stable connection. The R100 supports dual-band 2.4GHz and 5Ghz signals, which reduces the risk of dropout, and there’s a 3.5mm input too. We prefer using the smartphone app for controlling the radio, as it’s much quicker to search for radio stations using the search bar than it is to go through the layers of menus. MORE: Spotify Connect – What is it? How can you get it? However, neither buttons nor apps are quite the same as the satisfying click of a dial as you cycle through your inputs or crank up the volume. The icons on the screen are large and clear, the buttons – even if they’re a little less intuitive to use than knobs - are simply laid out and feel good to press, and the handle is comfortable to hold. That handle will come in useful if you add the £40 battery-pack, which gives you 12 hours of portable life. MORE: Binaural audio: What is it? How can you get it? If you like the time-honoured tradition of being woken up by the radio, the Roberts R100 can handle that too. There are two separate alarms that will each activate the DAB, FM, or Internet station of your choice or a normal buzzer. You can set up to 120 station presets in all – split equally between internet radio, DAB, and FM – and take a modicum of control over the radio’s overall sound sound using the R100’s various EQ settings. While listeners might find changing to the ‘Jazz’ mode better when listening to jazz, those that like a range of music might not want to keep fiddling in the settings menu, so we’d recommend keeping it on ‘Natural’. With a multitude of stations to choose from, how well does the Roberts R100 handle their sound? For a start, this radio puts across midrange speech well – and, arguably, that’s the most important quality. We go through an array of our favourite stations and the R100 keeps up with the variety of voices without any harshness or distortion. There’s a good sense of dynamism and clear distinctions from the loud, empowering choruses and smaller, more intimate moments. We listen to the score from Lin Manuel-Miranda’s Hamilton and its scale is immediately obvious. MORE: aptX HD Bluetooth – what is it? How can you get it? We get a clear delineation between the loud, exaggerated singing from the uppity Samuel Seabury and the quieter, snarky heckle from Hercules Mulligan as he encourages Alexander Hamilton in Farmer Refuted, more than other radios do. The R100 is well defined and spacious, its sound stretching out into our testing rooms. There’s a nice separation between the clashing voices of Hamilton and Seabury that means you don’t lose any of the vocals to disorganisation. Without a doubt, this radio can reach down into the bass, too. Lorde’s Royals, played through Spotify, is known for its earth-shakingly deep frequencies and punchy drum beats, and the R100 digs down to bring them all up. However, we’d like a little more detail from the bass. The boom of each note is a touch indistinct, with the R100 putting across a solid block of bass rather than the textured, layered sound that’s in the song. It also doesn’t time as well as it should, lacking the decisiveness in striking basslines or powerful guitar riffs that’s needed to get your head thrashing (or hand conducting, depending on your choice of music) to your favourite track. Despite The Buggles’ predicting their demise in the 1980s, the radio star isn’t dead just yet. Robert’s R100 is a more-than-suitable source for stations from Britain to the furthest corners of the broadcasting world. It’s easy to use and it’s sound quality means no matter what you’re playing through its numerous sources you’ll enjoy what you hear. 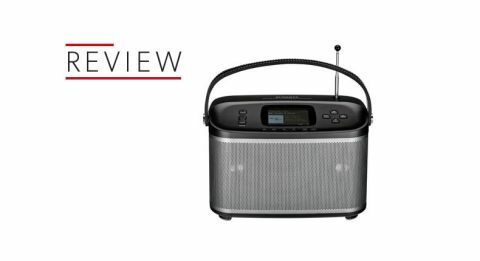 Whether you’re looking to replace an outdated FM radio, or wanting something to fill your kitchen with a bit more music, the R100 is a sensible choice.